Bryson DeChambeau was consistently longer off the tee than Derek Bard in the U.S. Am final. Rain delays, caddie changes, a bad tee shot at a critical moment. Nothing was going to keep Bryson DeChambeau from joining some of golf’s most elite company on Sunday. In winning the 115th U.S. 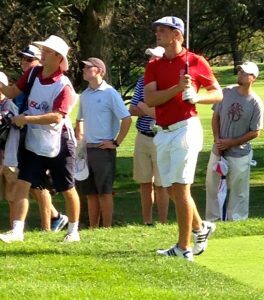 Amateur at Olympia Fields Country Club DeChambeau joined Jack Nicklaus (1961), Phil Mickelson (1990), Tiger Woods (1996) and Ryan Moore (2004) as the only players to win the NCAA Championship and the U.S. Amateur in the same year. The whole week was never much of a contest. Both finalists, DeChambeau and Derek Bard, get berths in next year’s Masters, U.S. Open and British Open, but there were few other similarities in their status after Sunday’s match. DeChambeau never played beyond the 16th hole in his first five matches and had even less trouble with Bard in the 36-hole final, winning 7 and 6 with a torrid nine holes immediately after the lunch break. That’s one of the widest victory margins since the tourney was inaugurated in 1895. A physics major at Southern Methodist University who lives in Clovis, Calif., DeChambeau, 21, opened birdie-birdie to go 2-up quickly, but that lead didn’t last. Bard, a 20-year old junior at the University of Virginia, won four of five holes in one stretch to go 2-up, but DeChambeau took charge for good after chipping in to win No. 8. The 47-minute rain delay didn’t help, but he battled back to get to all square and then won Nos. 14, 15 and 16 to claim the lead for good. There were some moments of adversity, though. During the 42-minute lunch break DeChambeau’s regular caddie, Mike Sly, told him that he couldn’t continue on the bag in the afternoon. A case of plantar fasciitis was too painful. No problem. DeChambeau called on a friend who had carried his bag occasionally in the past and only briefly lost momentum. His first tee shot of the afternoon round sailed left into the woods, and he was lucky to find his ball. Still, no real problem. Bard, who had won No. 18 to conclude the morning round, took advantage of DeChambeau’s rare muff to win that hole, too. Still, DeChambeau wasn’t ruffled. He went on a tear, stringing one great iron shot after another and backing up those approaches with brilliant putting. He had Bard dormie after winning No. 10 and closed out the match when Bard’s birdie putt lipped out on the 30th hole. It wasn’t just the dominating result that set DeChambeau apart from the field during the week. It was also his unconventional style. His trademark is a cap like the one Ben Hogan wore. He also spoke proudly of going to the same college as the late, great Payne Stewart, who also wore similar headgear. Staying low, Bryson DeChambeau lines up his putts much like he’d be taking aim with a gun. DeChambeau’s clubs are also unusual. The shafts are all the same length, that of a standard 6-iron. His style for lining up putts is different, too. He lines them up with his putter in a horizontal position rather than the usual vertical method – like taking aim with a gun. And, his training methods include cursive writing backwards with his left hand (he’s right-handed) because it improves the sensitivity in his hands. DeChambeau talked during the week of “revolutionizing’’ the game – eventually, of course. He plans to stay amateur for a while to take advantage of the perks of being the U.S. Amateur champion. He’s already on the U.S. Walker Cup team and invitations to a wide variety of big events are in the offing.